Pennsylvania State Senator Daylin Leach has announced his plan to once again introduce a bill to REMOVE THE MORAL/ETHICAL EXEMPTION to vaccine requirements for PA students. Similar legislation did not pass in the last session due to large numbers of citizens contacting their legislators to oppose his attempt to remove parental rights for vaccinations. IF WE ACT NOW, we may be able to kill this bill before it even gets a number! In a memo released on January 9, Senator Leach stated that “My bill will eliminate only the exemption for ‘a strong moral or ethical conviction similar to a religious belief.’” He notes 3,394 students filed a philosophical exemption in the 2013-14 school year. He does NOT point out that this is a total of 1.11% of the total students reporting, hardly a concern warranting the removal parental rights. Please CALL AND EMAIL YOUR STATE SENATOR. Ask to set up a personal visit to discuss your concerns over vaccine safety and government intrusion in health decisions. Without co-sponsors, this bill will not move. This is Discriminatory and Unconstitutional. Granting a right to religious groups without extending that same right to non-religious citizens is religious discrimination. Withholding public education to any citizen based on vaccine status is a civil rights issue that violates the PA Constitution. Vaccines Carry a Risk of Harm. Vaccines are pharmaceutical products that carry a risk of injury or death, a fact that was acknowledged by the U.S. Congress in 1986 when it passed the National Childhood Vaccine Injury Act. Since 1988, the federal vaccine injury compensation program created under that law has awarded more than $3 billion to children and adults injured by vaccines or to families whose loved ones died from vaccine reactions, although two out of three who apply are denied compensation. The Institute of Medicine in a series of reports on vaccine safety spanning 25 years has acknowledged there is individual susceptibility to vaccine reactions for genetic, biological and environmental reasons that have not been fully defined by science, and doctors often cannot predict ahead of time who will be harmed. Long standing gaps in vaccine safety research and emerging evidence that certain vaccines do not prevent infection or transmission of disease, urgently require legal protection of physician’s rights and parental rights regarding medical and religious exemptions to vaccination for minor children. Vaccine Manufacturers Have No Civil Liability. The 1986 law partially shielded drug companies selling vaccines in the U.S. from civil liability and, in 2011, the US Supreme Court completely shielded vaccine manufacturers from liability for FDA licensed and CDC recommended vaccines. There is no product liability or accountability for pharmaceutical companies marketing federally recommended and state mandated vaccines that injure Americans or cause their death, which makes flexible medical and non-medical vaccine exemptions in vaccine policies and laws the only way Americans can protect themselves and their children from vaccine risks and failures. Many New Vaccines are Coming. 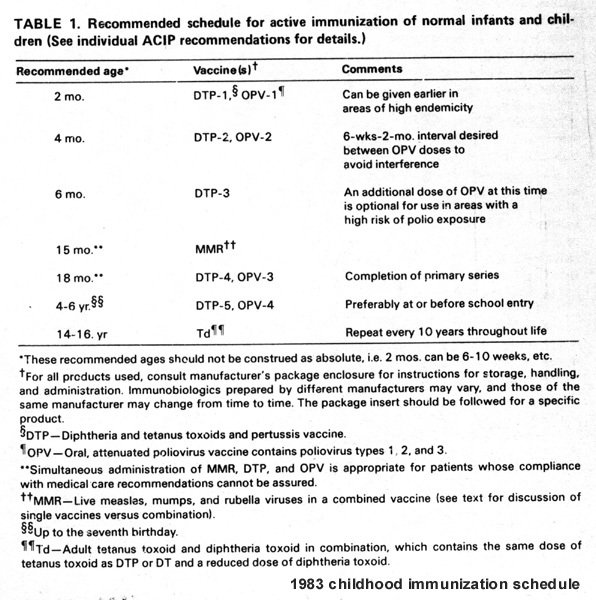 The CDC’s childhood vaccine schedule in 1983 was 23 doses of seven vaccines (DPT, MMR, polio) given before age six, and the cost of vaccinating a child with all federally recommended vaccines was $80 per child in a pediatric private practice. That cost has increased to about $2800 per child in 2015 because the numbers of federally recommended vaccines for children has increased to 69 doses of 16 vaccines between day of birth and age 18. There are several thousand vaccine clinical trials being conducted, including for infectious and non-infectious diseases such as gonorrhea, syphilis, chlamydia, HIV/AIDS, genital herpes, RSV, strep B, cytomegalovirus, hepatitis C, tuberculosis, e-coli, salmonella, asthma, diabetes, obesity, anti-cocaine and heroin use. Many of these new vaccines in development will be federally recommended for children. SUMMARY When there is risk of harm from a pharmaceutical product recommended by government, especially a product that is marketed by companies completely shielded from civil liability, the parent’s right to exercise an ethical or moral belief and informed consent on behalf of a minor child must be legally protected. In short, WHERE THERE IS A RISK, THERE MUST BE A CHOICE. The least restrictive means for ensuring the public health and safety should be employed by the legislature to protect public trust in the wisdom and fairness of government policy and law. There is no public health emergency in Pennsylvania or compelling state interest that justifies the passage the bill proposed by Senator Leach. If passed, the bill will violate human, civil and parental rights such as would never have been condoned by the state’s founding fathers and authors of the Pennsylvania Constitution. Following is a SAMPLE letter that you can use to help you to write your own or to speak concisely when you call. Please modify it as form letters get less attention. Also, insert the correct names. As a concerned citizen in your district, I am asking that you please refrain from co-sponsoring any legislation that will limit a parent’s right to informed consent for medical procedures such as that proposed by Senator Daylin Leach in a recent memo regarding the introduction of a bill to remove moral and ethical vaccine exemptions for PA students. The PA Department of Health recently updated their immunization policy for students in the Commonwealth and changes will go into effect this coming school year. In the updated regulations, they noted that the number of students in PA using philosophical exemptions is negligible. The 2016 Joint State Government Commission Report on Youth Immunizations reported, “However, exemption rates do not appear to account for the low vaccination rates.” (page 36) and “Therefore, the Work Group does not recommend that the exemptions be changed.”(page 37)There is absolutely no emergency that would warrant such a drastic action by legislators to unnecessarily infringe upon parental rights. Please protect the rights of Pennsylvania families by OPPOSING any legislation that limits the right to vaccine exemptions and discriminates against non-religious parties who want to make an informed choice.